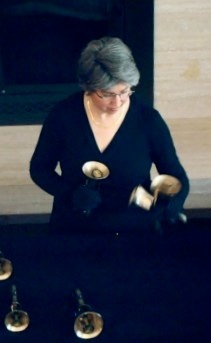 Handbell musicians wear gloves to protect bronze bell castings from spots caused by direct contact with bare skin. If not removed, these spots will mark the metal permanently. What type of glove to wear (or whether to wear gloves at all) is a highly personal preference, and may change over time. As a choir ringer, I started with cheap shared cotton gloves, progressed to gloves with plastic dots, and added Velcro® wrist straps when I began quartet ringing. My gloves changed again when I started solo ringing. Here are some thoughts to consider as you choose. To dot, or not: Gloves with dots and wrist straps are a good choice for most choir ringers. Dots provide a secure grip on bell handles, while wrist straps keep gloves in place during bell changes. For small ensemble ringers, wrist straps also prevent your partner from grabbing your glove along with the bell during hand-offs. If you find wrist straps confining, you can replace them with a longer piece of Velcro®, available from most fabric stores. More advanced ringers and soloists may prefer gloves with Velcro® straps but without dots, which allow quicker release for bell changes in fast passages. Finger damping is easier without dots, which stick to the casting. Look for gloves with extra padding in the space between your index and middle fingers, for four-in-hand. I wear this type of glove now for advanced solo work. I prefer gloves with dots for interlocked six-in-hand, especially while learning a piece. Dots keep the bells from shifting and causing blisters. Obviously, this works only for a piece with minimal finger damping. While learning six-in-hand technique, moleskin or medical tape strategically placed on your fingers can minimize blistering. I also suggest dots for plucking bells, especially in the high treble with your fingertips, as they grip the clapperhead better. Specialized gloves: Bass ringers (and others) often need extra protection for their hands. Jeffers sells leather gloves, polyurethane/nylon gloves, and knit gloves for bass ringers. Or try double gloves (wearing two pairs, one on top of the other). Go to a sporting goods store and try on different types of gloves, testing with a barbell from the store, to see which you prefer. Look for gloves with open fingertips, to facilitate page turns. Some handbell musicians swear by unlined Isotoner® gloves. Though more expensive, they last much longer. They come in two sizes: extra large, and one size fits all (about a medium). They’re just a little too large for me, but I do wear them for pieces that transition between the bell table and bell trees, because they come off with less fuss. Stores carry Isotoner® gloves only in winter, so look for them then, or shop online. For fancy styles, search online for bridal or dress gloves, and check costume shops. If you need a size or style not available from Jeffers, check the handbell manufacturer websites. Some bell directors, especially those on a tight budget, order parade gloves for marching bands. I know a ringer who’s a funeral director, and she wears pallbearer gloves! The “naked” option: Some musicians ring without gloves, pointing out that no other musicians wear them. There are pros and cons to this. I do ring without gloves when I mallet bell trees, to improve accuracy. It’s also easier to turn pages with bare hands, though you can dog-ear the page (alternating top and bottom) to make it easier to turn while wearing gloves. For solo ringing from memory, I find bells release faster with cotton gloves than bare hands, which stick to plastic bell handles. If you finger damp or hand damp a lot, as I do, bells stay cleaner if you don’t touch the metal with bare hands. Bass ringers and four-in-hand ringers may insist on gloves to prevent blisters. Uniformity among the bell choir isn’t necessary; an audience is unlikely to notice (or care) who’s wearing gloves, and who isn’t. Size: Jeffers has a sizing chart online and on the Gloves page of Vibrations to help you choose your size. Handbell gloves come in S, M, L, and XL, as well as children’s sizes S and L. Choose a snug fit for dexterity. Cotton gloves may shrink, unless washed in cold water and hung to dry. Color: I always wear black gloves in performance. Black goes with everything, and highlights the bronze castings, while white gloves draw attention to your hands. (I wear white gloves when teaching or conducting, for this reason.) It’s hard to match other colors exactly, and wearing an outfit and gloves in two different shades of red looks odd. If you want to dye or tie-dye your gloves, look for instructions in the Vibrations article archives. I’ve also seen gloves with decoration on the back. I prefer to draw attention to the instrument, not my wardrobe, but a “costume” enhances the performance for some ringers. Who pays? At less than $5/pair, handbell gloves are a bargain. In my opinion, a church that pays for choir folders for its chancel choir should likewise pay for binders and gloves for the handbell choir. Even in a community ensemble, it makes sense to budget for gloves, buying in bulk and ensuring you always have spares, instead of taking glove orders and collecting money from ringers. You often get a discount for buying a dozen pairs at once, in the same style but your choice of sizes. Caring for gloves: For health reasons, ringers should have their own gloves. To keep them separate, label the slots of a cardboard wine carton with names, then store the glove box with other bell equipment. You can also use a compartmental shoe bag, if you have somewhere to hang it. Ringers who take their gloves home can buy a zippered mesh pouch that fits in a music binder. Avoid plastic pencil pouches or plastic bags, because gloves need to dry out between rehearsals. Encourage ringers to wash their gloves at least once a month. If someone takes all the gloves home to wash together, mark ringers’ initials inside the wristband with an indelible marker or fabric pen. Because I practice every day, I wash my gloves every week in a mesh lingerie bag with other laundry, then hang them to dry. To wash white gloves, put them on and wash your hands, gloves and all, with bar soap. If dotted gloves stick, wash them several times to “break in” the dots. When gloves develop a hole at the fingertip, mend them by using the handle of a wooden spoon as a darning egg. Final glove thoughts: I keep separate performance gloves in a gear box that goes to every performance. I take at least two pairs of gloves that have been washed and paired, in case a glove develops a hole during performance. I set aside all my new gloves for performance. Over time, they get demoted from performance gloves to practice gloves to mended practice gloves, until finally I can’t stand them and throw them away. If your tired gloves still have life left in them, offer them to the Altar Guild for handling silver, or use dotted gloves to pick blackberries. When you sub for another choir, or attend a handbell class, bring your own gloves. Coming prepared is a sign of professionalism. If subbing for performance, ask what color gloves to wear. Even if you ring your own bells without gloves, ask permission before handling other people’s bells with bare hands. National handbell events nearly always require ringers to wear gloves.